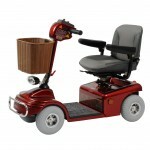 Why might I need a Mid-range 4mph mobility scooter? A Mid-Range 4mph mobility scooter is an excellent alternative to being pushed in a wheelchair. They are easy to use and a great 1st scooter for a novice user. A standard pavement scooter has a maximum speed of 4 mph making them a class 2 scooter in the DVLA categories. They have decent size batteries, which give a range of generally 15 – 25 miles. Most scooters in this category have maximum weight capacities of 21 – 25 stone. Front and rear lights are standard, with some models having indicators and brake lights. This is a popular category of scooter as they are easy to drive, comfortable, big enough to do most journeys and small enough to go shopping with. There are several things that people looking to buy a mobility scooter should know before purchasing one. Some legal requirements exist that may need to be understood regarding road use, speed restrictions and tax discs. Most of this category of mobility scooters are classified by the DVLA as class 2 i.e. 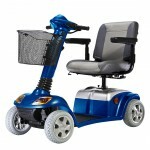 limited to a maximum speed of 4 mph and they can only be used on footpaths and not to be driven on roads. The same basic rules as pedestrians have. Mid-range mobility scooters currently do not require a tax disc registration because they aren’t allowed on the road. A full range of accessories are available for these scooters.